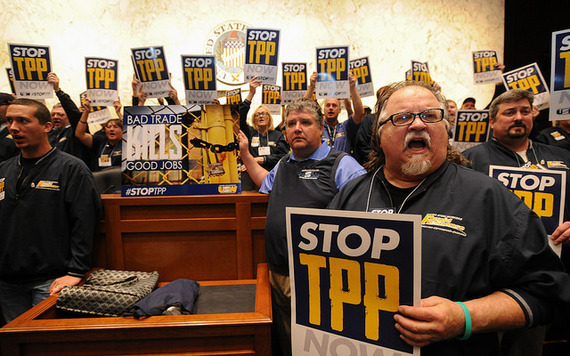 The defeat of the TPP is a tale of ants slaying a dragon. It seemed a fearsome task, challenging the powerful behemoth that is Wall Street, Big Pharma, the U.S. Chamber of Commerce, Big Ag, Big Oil, all their lobbyists, and all the Congress critters they’d “campaign-financed” to support their money-grubbing 12-country trade scheme. The battle was engaged, though, for the sake of workers’ rights, clean air and water, food safety, reasonably priced pharmaceuticals, national sovereignty, internet freedom, financial regulation, public control of public lands, the right of governments to pass laws for the public good without corporations suing for so-called lost profits in secret tribunals adjudicated by hand-picked corporate jurists, and the freedom of local governments to buy American-made products for taxpayer financed projects to create American jobs. And, frankly, so much more. For a righteous, just and equitable society. That’s why there were so many ants. Literally thousands of civil society groups coalesced to combat the TPP. These included labor unions, health care organizations, food safety advocates, environmentalists, churches, family farmers, social justice societies, indigenous rights organizations and allied groups in the 12 TPP partner countries. My union, the United Steelworkers, was among them. 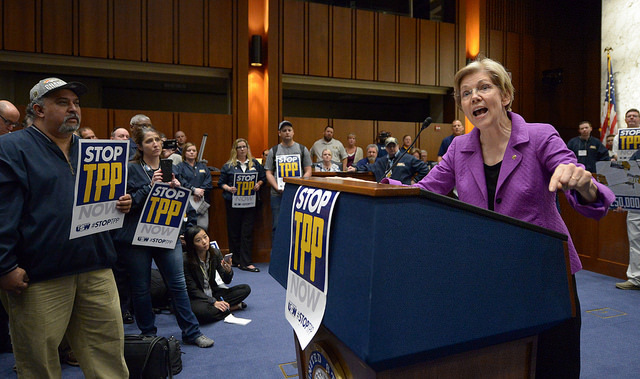 It was an overwhelming number of groups with an overwhelming number of members who conducted an overwhelming number of events over years to make it clear to lawmakers just how strongly citizens opposed the TPP. Let me tell you about the fire ant. They mostly live in mounds. If an animal steps on the mound, the ants will attack. A few ants are irritating. A bunch are annoying. Half a million fierce fire ants with tiny venomous stingers working together can kill a 10-pound animal. That’s what happened to the TPP. The anti-TPP forces conducted call-in days that resulted in hundreds of thousands of calls to Congressmen and women. When Congress was weighing whether to fast track the TPP, in other words to approve it without even bothering to amend it to fix it, the anti-TPP forces conducted an encampment on Capitol Hill for three weeks. This, and many other anti-TPP demonstrations, occurred a year before either party chose its presidential nominee. The USW Rapid Response, Legislative and Political departments worked with USW members to send to Congress more than 350,000 postcards protesting the TPP. USW members met with their Senators and Congressmen 1,500 times this year to oppose the deal. They held rallies, demonstrations, town hall meetings and even rock concerts to inform their communities about the problems with the TPP. They conducted large rallies and other events in Washington, D.C. They built support with their state legislatures and local governments, persuading cities and towns across the country to pass resolutions officially opposing the TPP. And that’s only what the USW did. The AFL-CIO was an important leader on this issue. And many other unions were just as active, and so were groups like the Sierra Club and the BlueGreen Alliance. The effort was relentless and concerted. And that’s why it was successful. For the USW, this win was a long time coming. It began 22 years ago when the USW took on NAFTA. The union filed a federal lawsuit trying to overturn that scheme. Unfortunately, the Supreme Court refused to hear it, and the USW lost. Workers continue to suffer devastation from NAFTA today, as manufacturers close profit-making American factories and re-open them across the border in Mexico where greedy corporations can make even more profit by destroying the environment and paying slave wages then shipping the goods duty free back to the United States. For example, Carrier announced in February that it would close two profit-making factories in Indiana and reopen them in Mexico. The result is 2,100 workers, members of the USW, will lose their good, family-supporting jobs. That’s NAFTA. That’s a trade deal negotiated by corporations for corporations. After that came Permanent Normalized Trade Relations with China in 2000. The USW strongly protested that as well, because the union believed none of the hype about how China was a huge market, and the United States was going to do all of the selling there. As it turns out, the USW was right. China has relentlessly dumped government-subsidized products on the American market, baldly defying the international trade laws it agreed to abide by when it signed that agreement in 2000. That has devastated companies that want to manufacture in America, including steel, aluminum, paper and tires producers. These manufacturers have repeatedly had to pay untold millions to file trade cases to obtain limited relief in the form of tariffs, and tens of thousands of workers have paid in the terrible form of lost jobs. The USW has protested virtually every so-called free trade scheme proposed since NAFTA, most particularly those with Korea and Colombia. In the case of Colombia, where more trade unionists were murdered than in any other country in the world, we asked for a delay in approval of the deal at least until safety for collective bargaining could be assured. We were ignored. And more trade unionists have been murdered every year since the deal took effect. Then came the massive, hulking dragon of a TPP, the likes and size of which had never been seen before. This time, the corporatists really stepped in it. This time it wasn’t just a few angry trade unionists stinging their ankles. This time the self-dealing free traders had pissed off far too many civil society groups. And they were organized. And they weren’t going to take it anymore. It’s not over, though. None of us oppose trade. We just want trade deals that, as economist Jared Bernstein and trade law expert Lori Wallach put it, are “written for all the cars on the road, not just the Lamborghinis.” For that to happen, all the groups that protested this deal must be at the table to negotiate the next deal – not just the corporations. The Lamborghinis are one interest group. We are many. No ant can move a rubber tree plant. But let me tell you, a couple million ants just killed a TPP monster. There’s high hope in concerted action. The first two photos are by Steve Dietz of Sharper Image Studios and show USW members at a 2016 anti-TPP rally in Washington, D.C. organized by the USW Rapid Response Department. The last photo shows the November Rock Against the TPP concert in Pittsburgh and is by Chelsey Engel, writer, photographer, singer.